I do not like baking. I don't really even like cake. At our wedding last August, we served donuts and blueberry peach pie instead of wedding cake. But a birthday? A birthday needs a cake. And a big birthday needs a big cake. 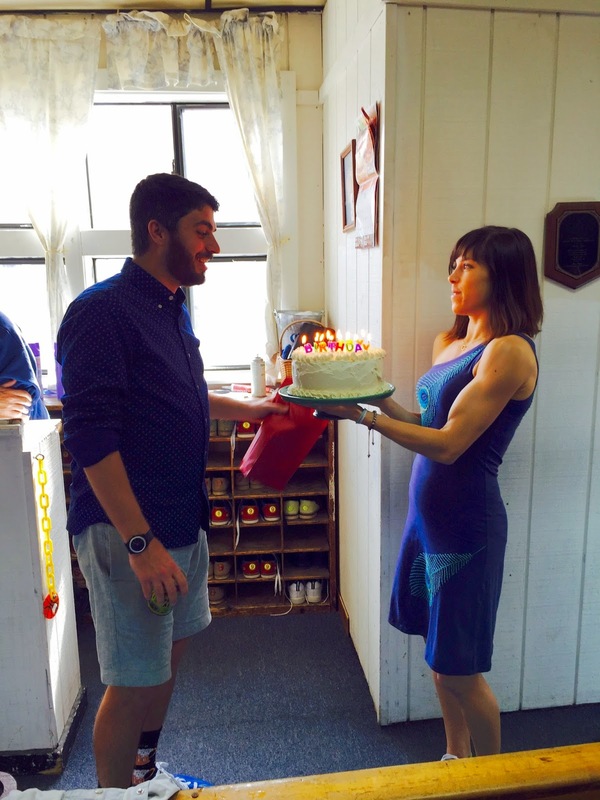 So I baked a big coconut cake for Chris's 30th birthday. Flour Bakery is a fantastic bakery and cafe in our neighborhood, and they make a mean coconut cake. Flour happens to peddle a baking cookbook, which also happens to contain a recipe for said coconut cake. So I turned to the pages of the Flour cookbook for this one. It was a labor of love, but the results were worth the effort. 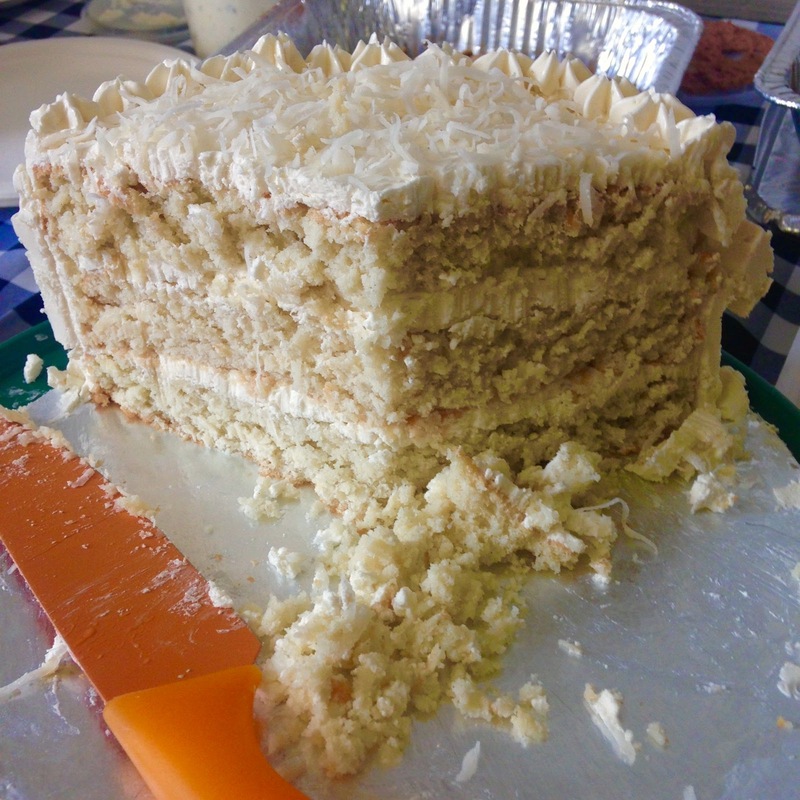 This cake is coconut on coconut. 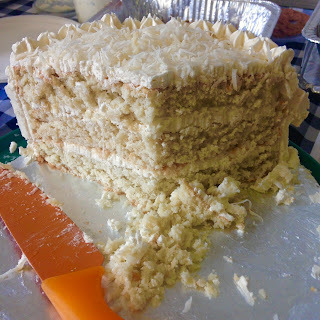 There is coconut in the cake batter itself and in the coconut butter cream frosting. It's serious business, but managed to taste light. One of the reasons I've disliked baking cakes is that, more often than not, my cakes turn out looking very, very homemade. Which is really just a nice way of saying they're ugly. The freezer is your friend. Frozen cake layers are so much easier to work with. I made my cakes a day ahead of time, wrapped them tightly in plastic wrap, and nestled them in the freezer. This made for easy trimming and frosting when it was time to assemble the cake. Level the cake layers. Trust me, your cake will look so much better. I used a long serrated knife to trim the curved tops off the frozen cake layers until I had nice, flat cakes for stacking. Use a cake board. You can buy cardboard cake boards at party stores and bakeries or you can cut one out of an old cardboard box. Frosting and transport made infinitely easier. Embrace the crumb coat. Oh, the crumb coat! Want your frosting to look smooth and beautiful? Spread a thin layer on the whole cake to seal in the crumbs, then refrigerate the cake for half an hour. 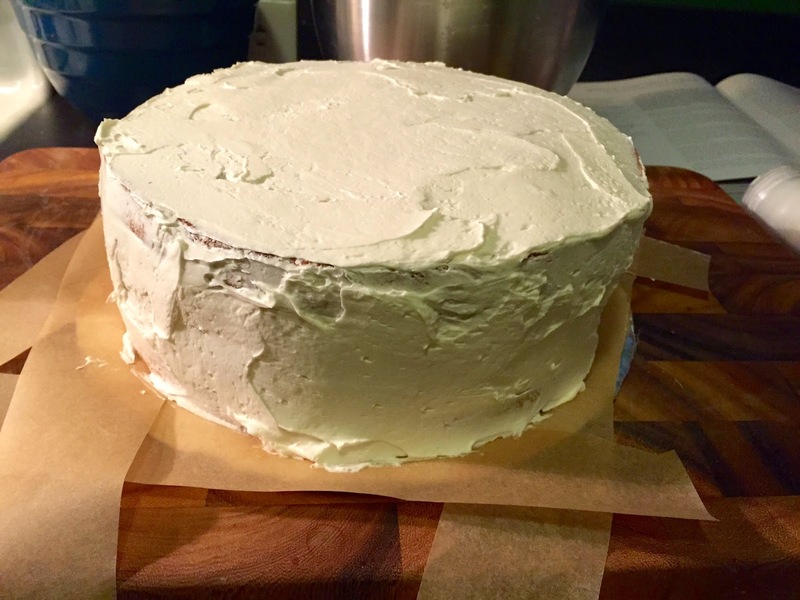 When you go to frost the whole cake with a nice thick layer of frosting, marvel at how smoothly it goes on. How did I not know about this before?! A kitchen scale is a wonderful tool. Precise measuring is imperative in baking (which is one of the reasons I don't like it). Not only does using a food scale take the guesswork out of measuring, is also means that I have fewer dishes to wash. When I baked this cake I simply kept adding ingredients to the bowl and zeroing out the scale between additions. The KitchenAid Stand Mixer is worth it. I had no idea what I was missing out on until my brother bought me one as a Christmas present last year. For much of the year, it serves as a counter top decoration to fool my house guests into thinking I'm incredibly domestic. But for the few times a year when I bake, I am reminded why I'm willing to sacrifice precious city apartment kitchen counter space. How does it make the batter so nice?! I don't even have to scrape the bowl. Magic. Follow the damn recipe. With cake baking, don't make your own substitutions. Follow the recipe exactly. If the recipe says to use cake flour, go buy cake flour. If you have to make changes, do the math. The exact math. I wanted to make 3 layers instead of 2 for a nice, tall cake that would feed a crowd. I increased all of my measurements by exactly 1/2. As for the party? 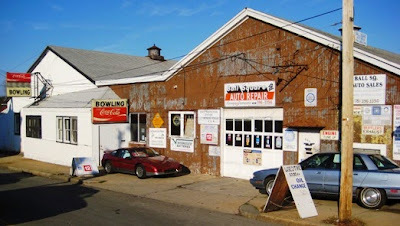 We rented out Ball Square Bowling, a small candlepin bowling alley near our home. It sure doesn't look like much from the outside, but it is one of the very best kept secrets around. We brought a bunch of beer, had trays of food delivered by Mei Mei Street Kitchen, and bowled for 3 hours on a Saturday afternoon. Sadly, the owner informed us that the bowling alley will be closing in the next year to make way for the Green Line Extension. Here's the recipe for the cake! *1 14.5-ounce can of coconut milk should be enough, according to the notes in the cookbook. Position a rack in the center of the oven, and heat the oven to 350 degrees F. Butter and flour two 8-inch round cake pans, or line with parchment paper. 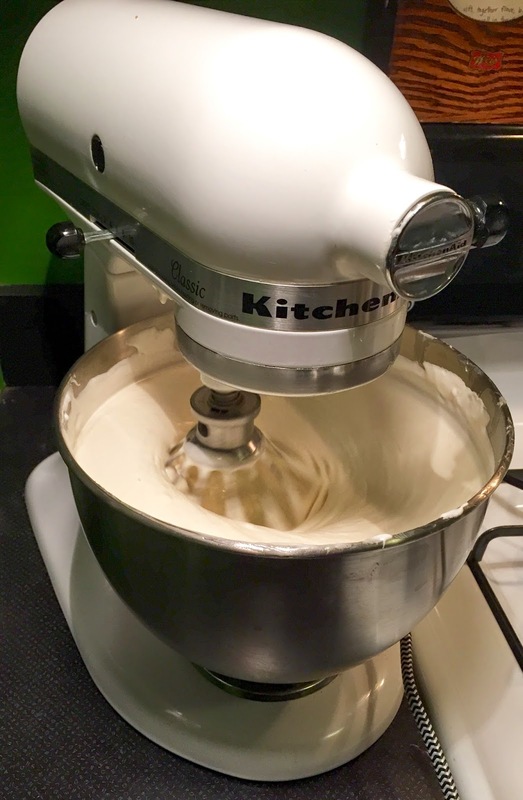 Sift the cake flour into the bowl of a stand mixer fitted with the paddle attachment (or into a large bowl if using a handheld mixer). Add the sugar, baking powder, and salt and beat on low speed for a few seconds to combine. Add the butter pieces and beat on low speed for 45 seconds to 1 minute, or until the mixture is coarse and crumbly. In a medium bowl, combine the egg whites, coconut milk, and 1 cup (120 grams) of the shredded coconut and whisk until thoroughly mixed. Us the tip of a knife to scrape in the seeds from the vanilla bean into the coconut milk mixture. Whisk until the vanilla seeds are well dispersed. Add about half of the coconut milk mixture to the flour mixture and beat on medium-high speed for about 1 minute or until combined. Stop the mixer and scrape the sides and bottom of the bowl well. Add the rest of the coconut milk mixture and beat on medium speed for 20 to 30 seconds, or until the batter is well mixed, light, and fluffy. Divide the batter evenly between the prepared cake pans. Bake for 35 to 45 minutes, or until the tops are firm and golden brown and spring back when pressed lightly in the middle with a fingertip. Let cool completely in the pans on a wire rack. *Here's where I deviated from the recipe and made this a two-day cake event. I wrapped the cooled cakes in plastic wrap and placed them in the freezer overnight, then came back to them for trimming and frosting the next morning. To make the frosting: While the cakes are cooling, in a small heatproof bowl, whisk together the sugar and egg whites to make a thick slurry. Place the bowl over (not touching) simmering water in a saucepan and heat, whisking occasionally, for 6 to 8 minutes, or until the mixture is hot to the touch. It will thin out a bit as the sugar melts. Remove from the heat and scrape the mixture into the bowl of the stand mixer. 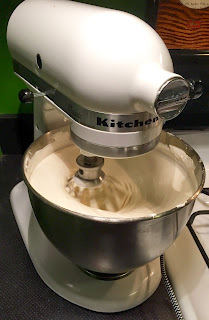 Fit the mixer with the whip attachment and whip on medium-high speed for 6 to 8 minutes, or until the mixture becomes a light, white meringue and is cool to the touch. Turn down the speed to low and add the butter, a few chunks at a time. Increase the speed to medium and mix for 4 to 5 minutes, or until the butter is thoroughly incorporated and the frosting is smooth and glossy. It will look curdled at first, but down't worry. Keep whipping and it will come together. If you haven't already, remove the cooled cakes from their pans. Using a long, serrated knife, trim the top of each cake to level it. Place one cake layer on a cake plate. Spoon about 2 cups of the frosting on top and use an offset spatula to spread it evenly to the edges. Carefully place the second cake layer, top-side down (so the even, sharp edges will be on the top of the finished cake), on top. Spoon on about 1 cup of frosting and spread it over the top and down the sides of the cake, smoothing the frosting as well as you can and covering the entire cake with a very thin layer of it. This is the crumb coat, which will keep any loose crumbs from migrating to the surface of the finished cake. Place the cake in the refrigerator for about 30 minutes to firm up the crumb coat. Beat the remaining frosting (about 2 1/2 cups) briefly with a wooden spoon to keep it creamy. Spoon it on the cake (if desired, reserve a small amount for piping a decorative border) and spread it evenly across the top and down the sides. This is the finishing layer of frosting. Press the remaining 1 cup (120 grams) shredded coconut evenly onto the top and sides of the cake, covering the cake completely. As you work, hold the cake over a plate or bowl to catch the falling bits of coconut, so you can reuse them. Spoon any remaining frosting into a pastry bag fitted with a small round tip and pipe a decorative line along the top and/or bottom edge of the cake. The cake can be stored in an airtight container in a cool place for up to 3 days. I have this cookbook but used your recipe for ease. The cake itself seemed so very moist and dense, and I had to cook it extra. And it smelled very eggy. But when we actually ate it, it was pretty amazing. AMAZING. Super moist and delicious. But, I just pulled the cookbook out again and it says 6 egg whites, not 12, in the cake. (Also, the cake flour is 2 1/4 cups). Curious, did you also do 12 egg whites when you made it or was that a typo? And now I can't decide what to do when I make it today. 6 or 12?? Maybe I'll do 9. I make this cake often. It is 6 egg whites in the batter not 12. Hope the birthday went well. Seems that you all are having a great time together. My sister in law arranged a family dinner for some relaxing time to be spent together. 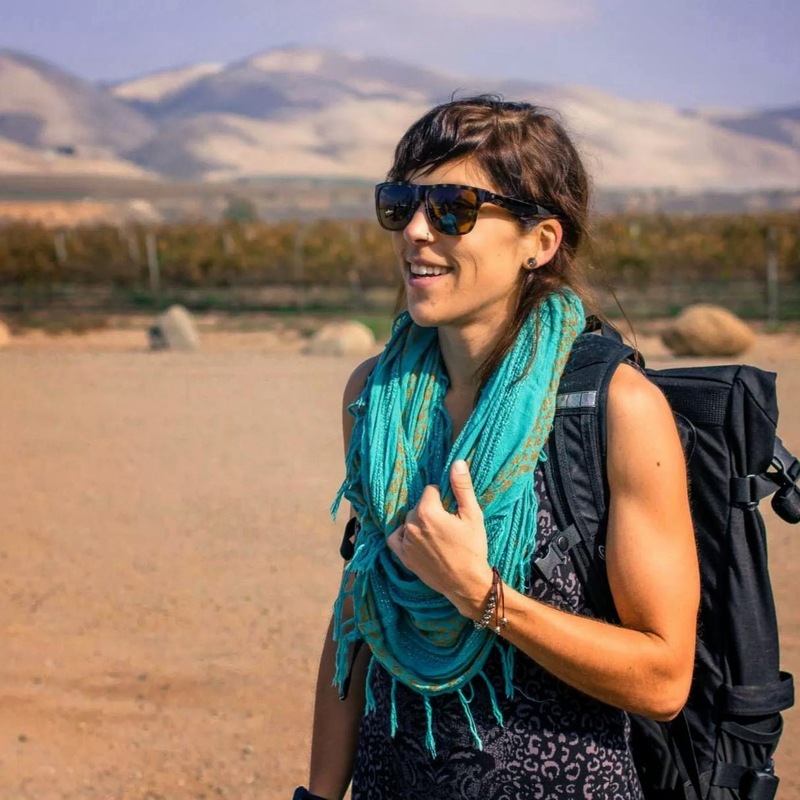 Hired one of the best LA event venues with Mexican and continental food. Cup cakes and drinks were ordered according to everyone's taste. Well spent day it was!